Rwanda geographically located in the Eastern part of the African Continent is among the good places ranked for Wildlife viewing with different Primates, Apes and Species which include Mountain Gorillas, Chimpanzees, Golden Monkeys, Black & White Colobus Monkeys, Blue Monkeys, Vervets, Baboons, Red tailed Monkeys, African Big Fives (Elephants, Buffaloes, Leopards, Rhinoceros), other big games like Zebras, Giraffe, different bird species like African Jacana and more. 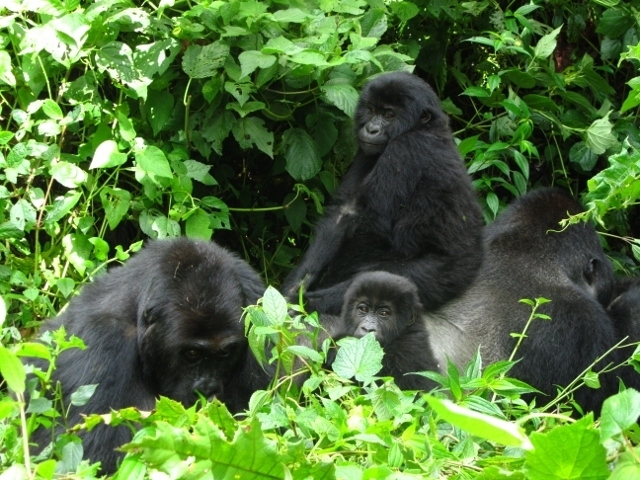 Below are some of the major Primates, Apes and Species to see while on your Wildlife and Primate Safari in Rwanda. These are black herbivorous ground dwelling apes which feed on young bamboo shoot, stem, foliage, tree leaves, flowers and some fruits like Mangoes, Jack fruit, Oranges, Apples, Water melon, Sweet bananas, Avocados but only when provided because these apes cannot climb trees, they only feed on ground. Gorillas usually live in groups composed of female and male members led by the old dominant Male Silver backs, these Silver backs are responsible for protecting its group members, leading them in the Jungle, looking for what to eat and constructing of temporary huts for Shelter out of grass and tree branches. These are Omnivorous primates which feed both on fresh and grass but they mostly feed on young bamboo shoot, stem, flowers, Sugar canes and fruits like Mangoes, Oranges, Jack fruit, Avocados, Water melon, Sweet bananas, Apples and more. Chimpanzees are ranked to be the Closest Primates to human being features, Chimpanzees are not like Gorillas they feed both on the ground and up in the tree branches. These are herbivorous primates; they mostly feed on Young bamboo shoot, stem, flowers, tree leaves, Sugar canes, and fruits like Mangoes, Maize, Jack fruit, Avocados, Oranges, Apples and more. These Primates are mostly black and brownish in color with white strips in their faces, they are like Chimpanzees feed both on ground and up in the tree branches. Golden Monkeys like bamboo trees therefore there are mostly found in places covered with bamboo forests. These animals include African Elephant, Leopards, Lions, Cape Buffaloes and the Rhinoceros; they are called the African big fives because they were very difficult to hunt on foot by local hunters and very dangerous to human beings. These African Big Fives are real residents in Rwanda mostly found in Akagera National Park. Other Primates to see include Black & White Colobus Monkeys, Blue Monkeys, Red tailed Monkeys, Vervets, Baboons, Cheetah and different bird species. 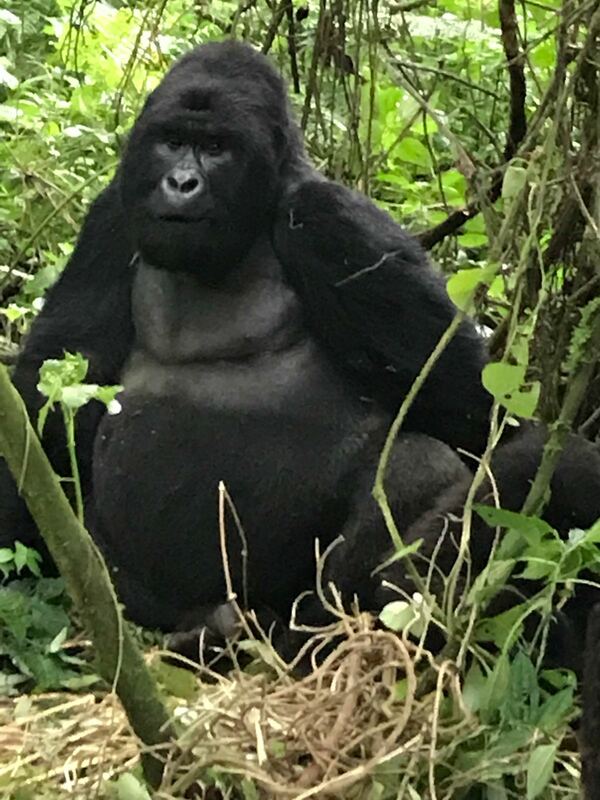 These destinations listed below are the top major ones you must go for successful and discoverable Wildlife and Primate Safaris in Rwanda. This is Rwanda’s popular destination which every visitor to Rwanda would not wish to miss visiting it before leaving back to the home country. 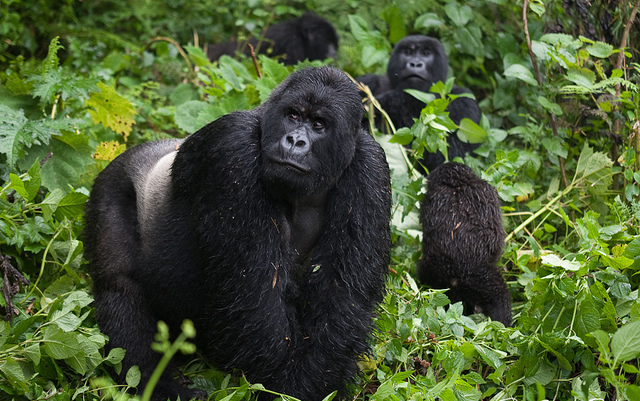 It is located in the North western part of Rwanda bordering Virunga National Park of Democratic Republic of Congo, its characterized with tropical rain forest, bamboo forests, Savannah grasslands and some parts covered with Swamps. This Park is mostly known for the shy endangered ground dwelling Mountain Gorillas in the mist and Golden Monkeys which are mostly found in areas covered with Bamboo forests. Compare Chimpanzee tracking in Uganda, Rwanda and DR Congo. It is about 2-3 hours to drive from Kigali up to Volcanoes National Park in Ruhengeri province using a stable Safari Jeep with a fluently English-speaking guide. Not only gorilla trekking tours but also you can do the hiking of the popular mountains named Gahinga, Sabyinyo and Muhabura Mountain in Volcanoes. This is another destination in Rwanda commonly known for its eco – systems composed of Mountains, Savannah grasslands and Swamps; it is located in the South western part of Rwanda characterized with mountainous tropical rain forest. It is home to several primates including the habituated Chimpanzees, Monkeys (Black & White Colobus, Vervets, Blue, Red tailed), mammals, and also ranked to be among the best sites for bird watching in Rwanda with different bird Species recorded sightable. Visiting Rwanda for the African Big Fives, Akagera National Park is the best place to go located in the Eastern part of Rwanda characterized with tropical rain forest, Savannah grasslands and some areas covered with Swamps. The mostly seen African Big Fives in Akagera National Park include Elephants, Buffaloes and the Rhinoceros (Black & White) plus other big game animals which include Zebras, Giraffe and more. Different aquatic species which include Hippopotamus, Nile Crocodiles and different Water bird species are residents in most of the lakes and rivers in Akagera.